and Artist ROY GRINNELL: The overall size of this lithograph is 24" x 30"
RAF Station North Weald had been fogged in all the latter part of September 1941, so much so that the senior pilots of 71 Squadron’s “A” Flight were given a few days’ leave. As the weather cleared on 2nd October, Squadron Leader Stanley T. Meares took a flight of newer members on a combat air patrol over the English Channel. Newly-assigned Pilot Officer Carroll W. “red” McColpin, was flying as Meares’s wingman in his Spitfire Mk VB, coded XR-Y. 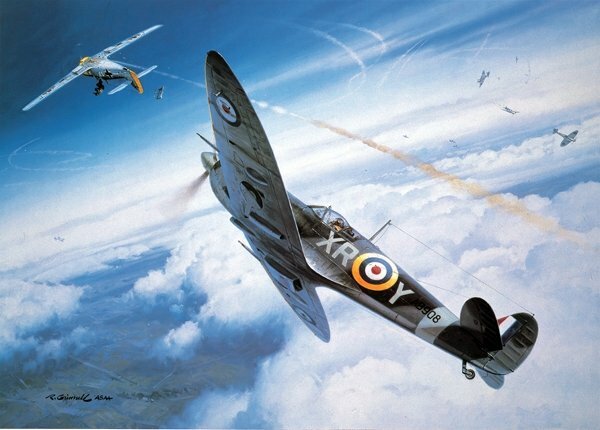 At approximately 1340, McColpin spotted 18-20 Me-109Fs a few hindered feet below, and called out the bogies to Meares. As they dived to the attack, Meares fired on the nearest 109. McColpin followed, firing a half-second burst from under 50 yards. The German fighter burst into flames.